Floater and doubly terminated loop-like growth with a thin central zone and progressive widening toward the terminations, typical with prase Quartz from this locality. 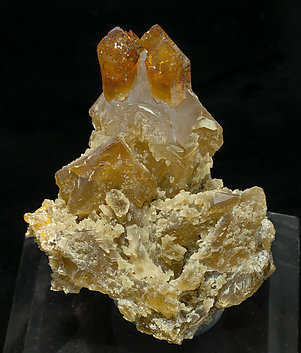 Group of citrine Quartz crystals that have a pale color and dull faces with corroded prism faces. They are reverse sceptered growths with transparent and bright crystals that have a very intense and deep color. Exceptionally rare, it is the first sample of citrine Quartz we have never seen from this locality. Pinecone-like aggregate of very well defined spear-point-shaped crystals that are dipyramidal, with no prism faces. 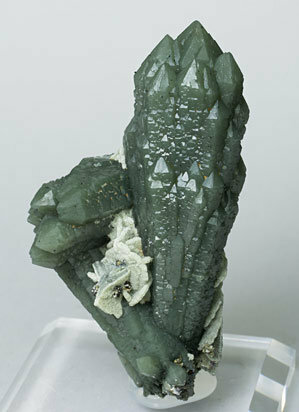 They are bright with an intense green color due to inclusions, probably Actinolite and/or Hedenbergite. On the sample there are parallel thin laminar gaps, left by dissolved Calcite crystals. 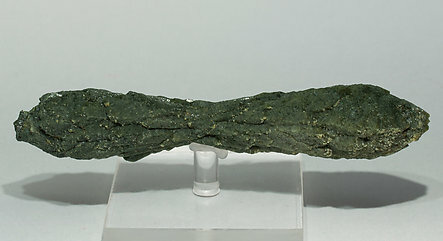 Parallel aggregate of crystals with the very neat tapered shape typical of “prase” specimens from Serifos. They are translucent and have a uniform green color. 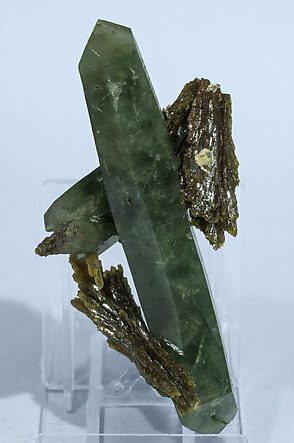 Spear-shaped crystals on matrix. 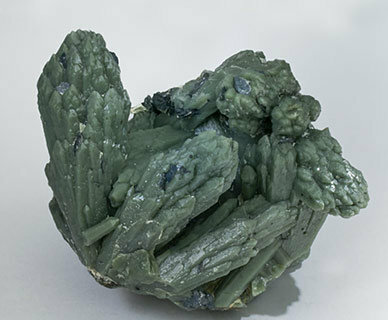 They are dipyramidal with absent prismatic faces, and are bright with an intense green color due to inclusions, probably Actinolite and/or Hedenbergite. Very well defined spear-shaped crystals that are dipyramidal, with absent prismatic faces. 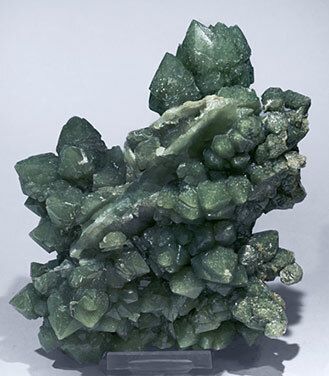 They are bright with an intense green color due to inclusions, probably Actinolite and/or Hedenbergite. On the sample there is Quartz with a very different shape, probably a first growth phase, a coating or a substitution of Calcite crystals which have disappeared. 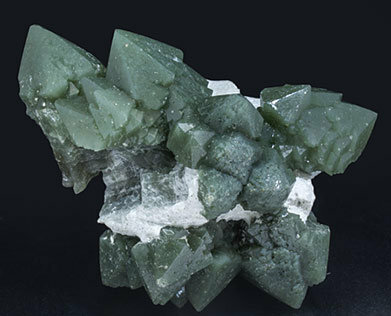 The Quartz has formed parallel polycrystalline growths with flattened, almost laminar forms filling and following the empty spaces left by the earlier Calcite. Aggregate of crystals that have polycrystalline surfaces and with the tapered shape typical of the samples from the locality. 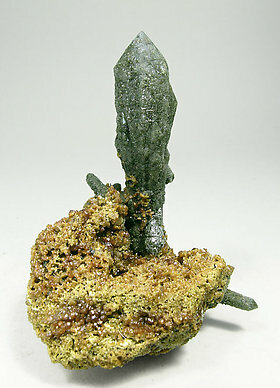 The sample, very aerial and esthetic, is bordered, at the base, by small Andradite crystals. The sample is from the Desmond Sacco collection, whose label we’ll send to the buyer. Quartz crystals with very well defined polycrystalline surfaces, with the typical spindled shape of a lot of the samples from this locality and with a rosette of thin-tabular Calcite-Dolomite crystals. Divergent polycrystalline growths of prase Quartz, bright and with very well defined faces and edges and small rosette growths of laminar Hematite crystals. 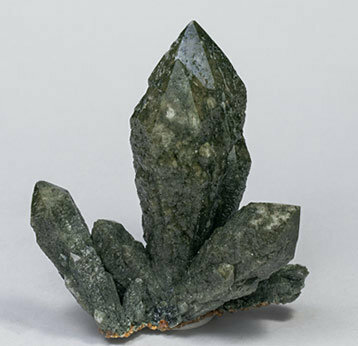 The crystal has polycrystalline surfaces with the typical spindled shape of the samples from this locality. 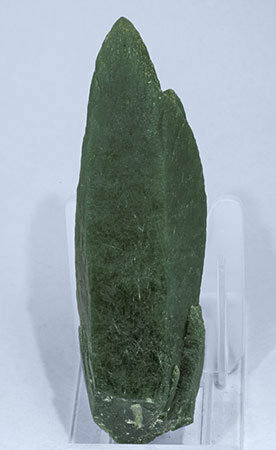 The sample is very aerial and esthetic on a matrix very rich with small crystals of Andradite. Crystals with polycrystalline surfaces with the typical spindled shape of the samples from this locality. 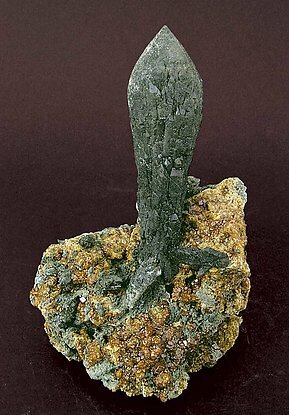 The sample is very aerial and esthetic on a matrix very rich with small crystals of Andradite. The crystal is large, very aerial, has good color and brilliance. It stands out from the matrix, and has the typical widening for prase Quartz from this locality. The matrix has other small prase Quartz crystals as well as small Andradite crystals. Pair of two Quartz crystals, one of them complete and doubly terminated. 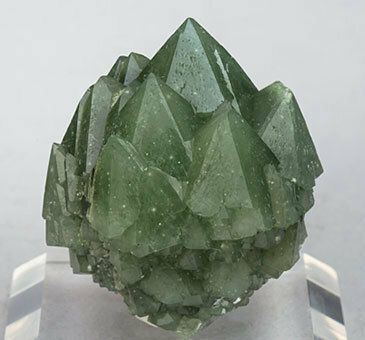 Both Quartz crystals are very rich in Chlorite inclusions with an intense green color and they are very bright. 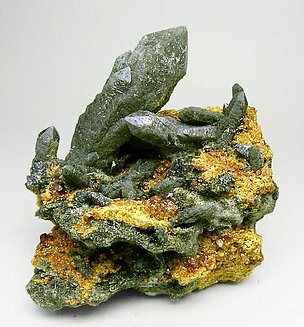 There are some “bundle-like” Epidote aggregates, very bright and with a deep green color, attached to them .